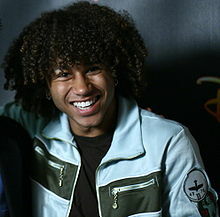 Ta Corbin Bleu Reivers (va ruggit er 21 Toshiaght Arree, 1989 ayns Brooklyn, York Noa), ny aghteyr, ny vannakeen, ny ghaunseyr, as ny arraneyder Americaanagh. Ta enney mooar er er son e phaartyn 'sy straih scannaneyn High School Musical. Hie yn duillag shoh er ny reaghey er 5 Jerrey Souree 2013, ec 21:01.